Several new data products are now available at https://www.colorado.gov/cdphe/chronicdisease. 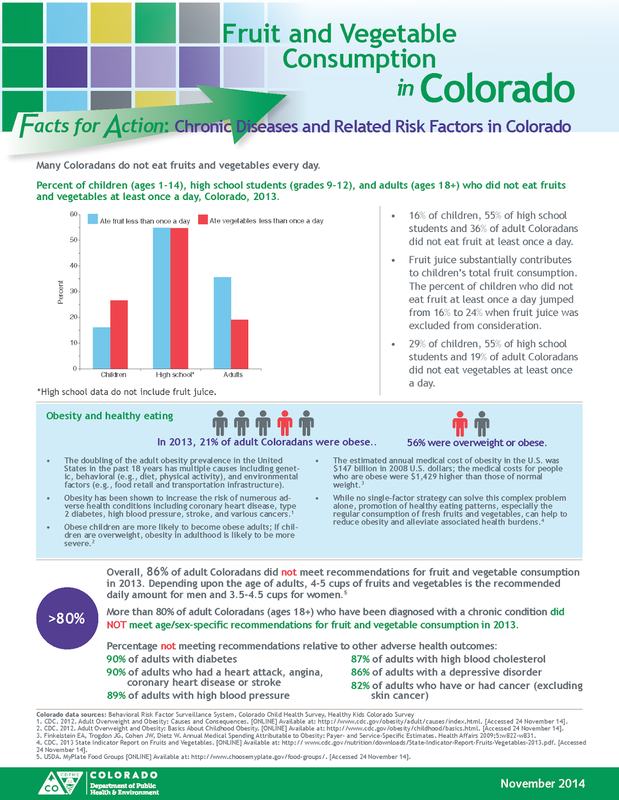 As part of the “Facts for Action: Chronic Diseases and Related Risk Factors in Colorado” series of fact sheets, the new documents present recent data on fruit and vegetable consumption, cardiovascular disease, high blood pressure, and cancer in Colorado. "Fruit and vegetable consumption in Colorado"
Healthy eating is important for maintaining a healthy weight and overall health, yet many Coloradans do not eat fruits and vegetables every day. This fact sheet examines fruit and vegetable consumption among adults and youth and individual-level and community-level factors associated with availability and consumption of fruits and vegetables. "Cardiovascular Disease Burden and Disparities in Colorado"
Cardiovascular disease is costly and a major cause of morbidity and mortality in Colorado. This fact sheet examines the prevalence, trends, and disparities in cardiovascular disease and related risk and preventive factors as well as hospital discharge and mortality rates and trends. "High Blood Pressure Awareness in Colorado"
Nearly 1 million adult Coloradans were aware of having high blood pressure in 2013.This fact sheet examines the prevalence, trends, and disparities in high blood pressure awareness, hospital discharge rates, mortality rates, and comorbidities. "Cancer Disparities in Colorado: A Focus on Race and Ethnicity"
Cancer is the leading cause of death in Colorado. This new fact sheet examines racial/ethnic differences in cancer incidence and mortality.